PfTRiC is exported to the cytoplasm of P. falciparum iRBCs. (B) Immuno-fluorescence studies of erythrocyte infected by Pf3D7 at the early (row 1) and mid (row 2) trophozoite stages and at late schizonte stage using PfTRiCθ specific antibodies (in red). 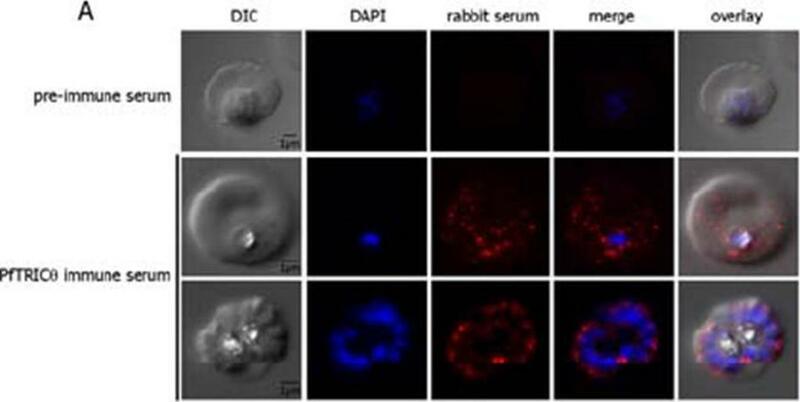 DAPI: DAPI staining of the parasite nucleus (in blue). (C) Double IFA labelling of PPfTRiCθ (in red) and the rhoptry protein PfRhopH2 (in green) in segmented schizonts using specific sera and methanol-acetone fixed infected erythrocytes. 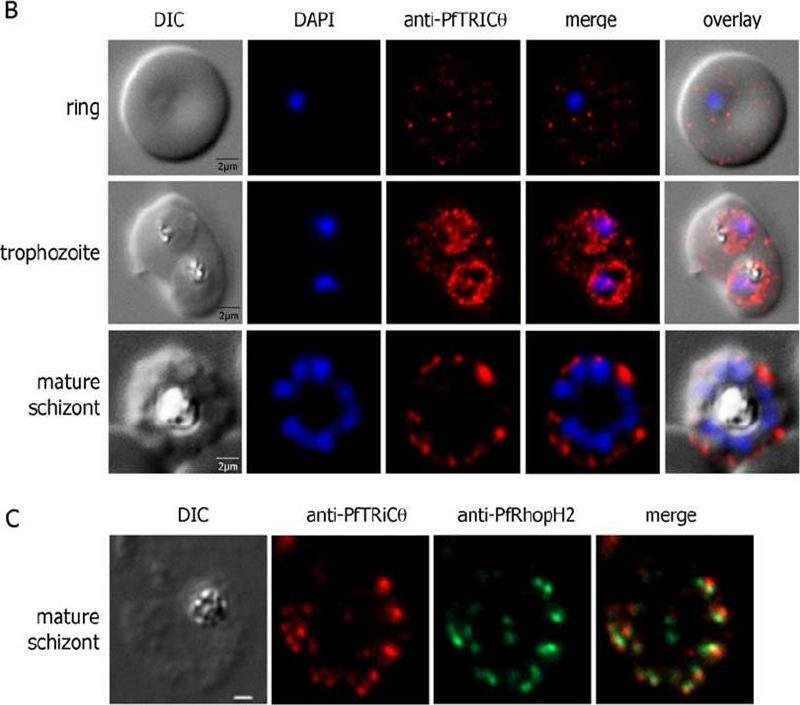 PfTRiCθ was detected in the iRBC cytosol from early rings to early schizonts. 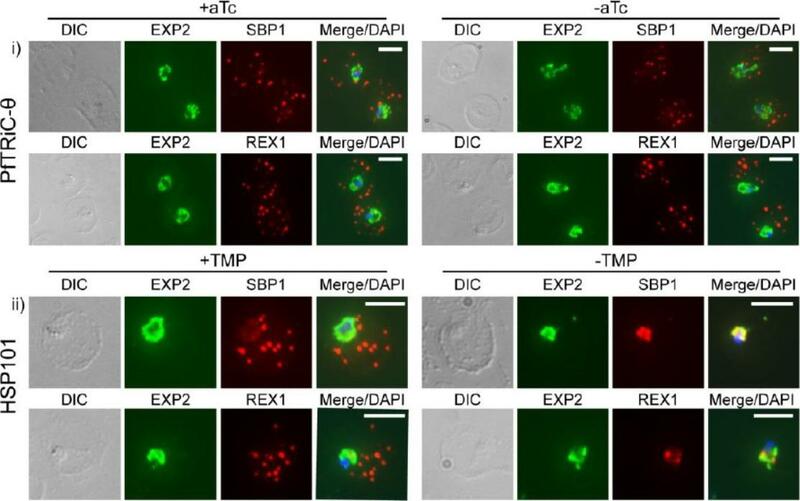 Labelling of the parasite (and possibly the parasitophorous vacuole) was instead observed for mature stages (mature trophozoites to schizonts). Moreover, following the individualization of merozoites, PfTRiCθ was only detected at the apex of each merozoite. 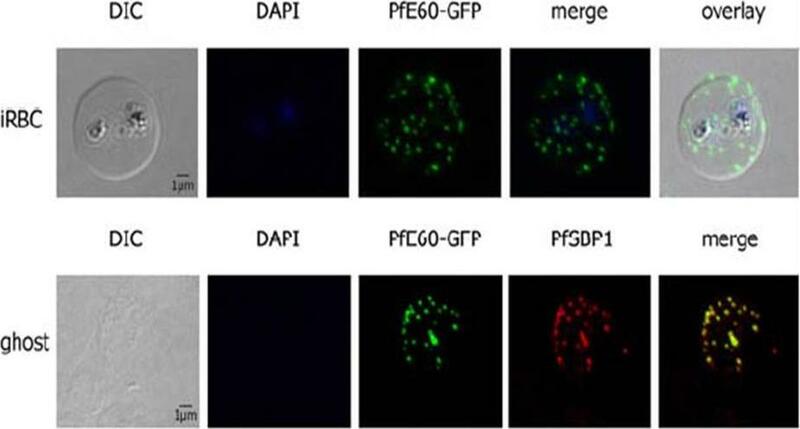 Double labelling immunofluorescence experiments using anti-PfTRiCθ and anti-RhopH2 antibodies.Mbengue A, Vialla E, Berry L, Fall G, Audiger N, Demettre-Verceil E, Boteller D, Braun-Breton C. New Export Pathway in Plasmodium falciparum-Infected Erythrocytes: Role of the Parasite Group II Chaperonin, PfTRiC. Traffic. 201516(5):461-75.